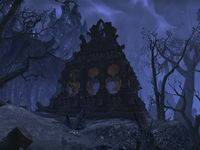 Font of Schemes is a Daedric ruin in western Coldharbour. The ruin is the site of special crafting tables where you may create items in the Oblivion's Foe set. The crafting station is south-west of the map symbol, along the cliff wall.